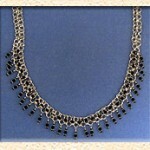 I have made jewelry for more that 30 years and worked in many different medias. I am a member of the Society of Midwest Metalsmiths. I have always been intrigued with patterns that challenge my analytical thinking. I have pursued many different art forms throughout my career. I love to wear jewelry so I was naturally drawn to making wearable art. Chaining has been one of the most satisfying media I have found. I begin with straight wire; form rings, hand cut the rings, and then make the chain. I like patterns that seem to “flow” and “float” when worn. My work is mostly in silver. but I occasionally use gold or colored wire. Formal Education- Diploma, St. Luke’s Hospital School of Nursing. BSN, Washington University, MSN and PhD, St. Louis University.